Looking for privacy in a park like setting? 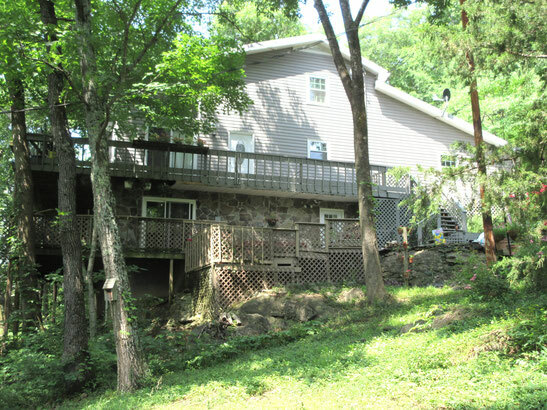 Check out this mountain top, custom built, one owner home on 14.69 wooded acres. This unique 3 bedroom, 3 bath contemporary offers 3342 sq ft of living area and 2000+ sq ft of decking to enjoy the panoramic views of the surrounding mountains, valley and Nolichucky River. Main level offers a vaulted ceiling great room with stone fireplace, laminate floor and six patio doors to access the decking, spacious kitchen with ample oak cabinets, walk-in pantry, ceramic tile floor and appliances, main level bedroom, full bath, laundry with sink and storage shelving and two car garage complete the main level. Upper level offers two bedrooms, oversize walk-in closet, full bath and balcony overlook. Lower level offers another 700+ sq ft family room with hardwood floor, stone wall/hearth with woodstove and six patio doors to access lower decking, galley kitchen with stove, refrigerator and walk-in, shelved storage closet, full bath with ceramic tile walk-in shower and unfinished storage. Relax in the hot tub or cool off on a hot day in the above ground pool. Only 10 minutes to Jonesborough and 20 minutes to Johnson City. Concrete and gravel driveway but front wheel or four wheel drive is recommended to access.